A few of the best racing birds of Arpad Sudiciki from Serbia will be sold in an exclusive PIPA auction. He is arguably one of the best players in the Balkans. The first pigeon is his Olympiad Pigeon Boeing 747: winner of two first prizes, and originating from the bloodlines of De Rauw-Sablon x Marcelis. 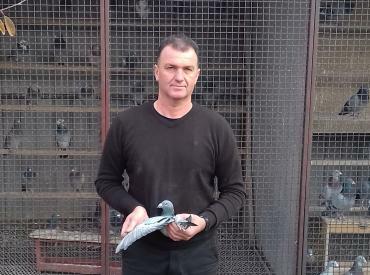 He is also selling his Olympiad Pigeon long distance White As. This bird comes from De Rauw-Sablon, with a bit of Dirk Van Den Bulck mixed in. And that's it: these two top class pigeons will be sold in a small but exclusive auction.